As you move around this small but beautiful village, there is a lot that catches your eye. It’s as if this place was laid out with tourism in mind. There has been growing awareness about this border recently for its preserved heritage and geographical relevance. Attari Wagah Border has a great chronological importance for Punjab state where the tourism department has taken up the challenge to enhance tourism here by offer better facilities for tourists who come here to attend a retreat ceremony of the Indian Army. On a daily basis, this small village of Amritsar strains to accommodate around 18000 tourists for retreat ceremonies of the Indian Army. 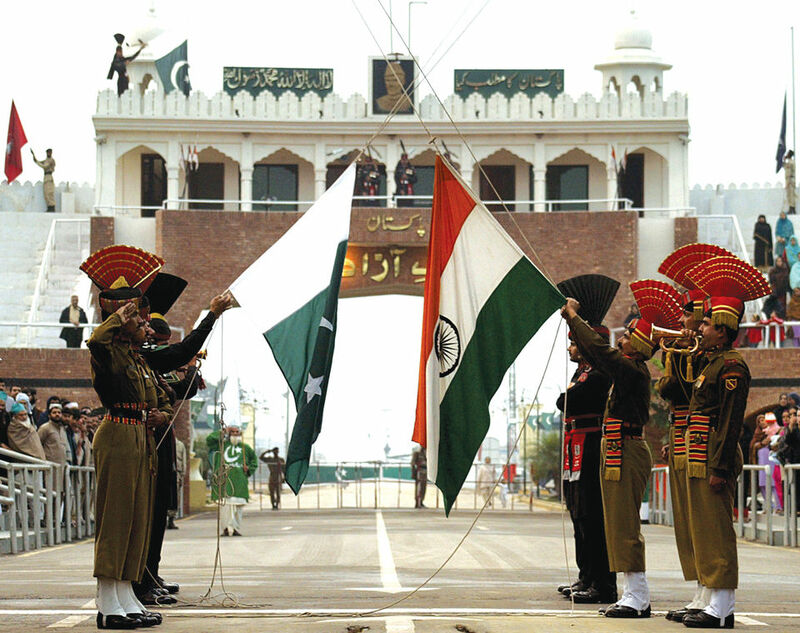 Attari wagah Border is the most popular tourist attraction of the Amritsar city of Punjab. Each evening you can watch a retreat ceremony that takes place with the Border Security Forces on the Indian border. Flags of both India and Pakistan are lowered and the rhythmic sound of a thrilling parade enchant. This parade is performed by soldiers of both countries. Millions of people come here to enjoy this electrifying experience. It is an awe-inspiring parade where soldiers of both countries carry flags proudly in their hands. The change of guards that takes place on Pakistan side and the flag lowering by the Indian Army is performed by the strictly dressed skillful soldiers. These ceremonies conclude at twilight alongside a bugle sound that you can hear together from the both sides. This often reflects enthusiastic relations between India and Pakistan with flags of the two countries retrieved ceremonially at the same time. Patriotic vehemence at this time grows in the switched lights of Wagah Border is the only land route to approach the Pakistan and central Asia together. In the last couple of years, the top brass of Indian Home Ministry, Finance Ministry and Secretaries & Joint Secretaries have been visiting this border. They have made visits to see the poor conditions that prevail here. Several meetings also have been organized at the Attari wagah Border to sensitize them to solve problems faced by tourists who visit this place regularly. The border with Pakistan lies roughly 30kms from Amritsar at Attari on the Grand Trunk Road to Lahore and is one of the main access points overland to the neighbouring nation. A flag-lowering ceremony is held here daily at sunset by both sides. And along with the interactive patriotic fiesta that precedes it, the ceremony is a huge attraction for visitors. Another attraction in close proximity is the complex housing the samadh of Sham Singh Attari. A celebrated General of the Sikh Empire, he fought valiantly and is known for his last stand at the Battle of Sabraon. The grounds include samadhs of his family members, a museum dedicated to the General and his descendants, and a water tank. A similar albeit larger tank can be seen a short distance away at Pul Kanjri. It makes for a good picnic spot a stone’s throw from the fenced border. Officials at Attari Wagah Border have taken care to ensure the needs of tourists visiting this ceremonial retreat of Indo-Pakistan soldiers are made comfortable. They have provided several restrooms, washrooms and other types of facilities for tourists to welcome them. The Tourism department of Punjab has now acquired some land to construct restaurants, hotels and more accommodation for tourists. Parking facilities have been provided closer to venue for a Retreat Ceremony. Popular among the local, national and international tourists, it’s interesting to make a visit to the famed Wagah Border Amritsar . Thanks to a new terrain in Indo-Pakistan relationship, it has prompted the setting up of a global tourism focal point at Amritsar here. The city of Amritsar is the place that exhibits the diversity of Indian culture. The richness of the city will make you experience the real flavours of Indian heritage & traditions. Being the home of Sikh Communities, you will find Wagah Border Amritsar as the prime destination. The perfect time to visit Amritsar is from November to March as the weather is comparatively pleasant and is ideal for amritsar sightseeing. Amritsar tourism offers many tourist attractions to visit.